I made these ALL BUTTERCREAM (no fondant) cupcakes for my brother's 23rd birthday. Thomas, a big Toy Story fan, has been waiting to see the new movie for days now and was planning to see it yesterday in honor of his golden birthday--23 on the 23rd. Thomas, like the rest of my family, hates fondant--so I used pastry bags to ice the cupcakes instead. I'm really happy with the way they turned out. I regret to inform you that in a mere TWO MONTHS I'll be heading off to college at the University of Maryland, College Park, where I will be largely unable to bake cakes (although, if a big, awesome project came up, I'm close enough that I could try to make it home for the weekend and do it.) I want to make these last two months count by making as many cakes and cupcakes as possible. 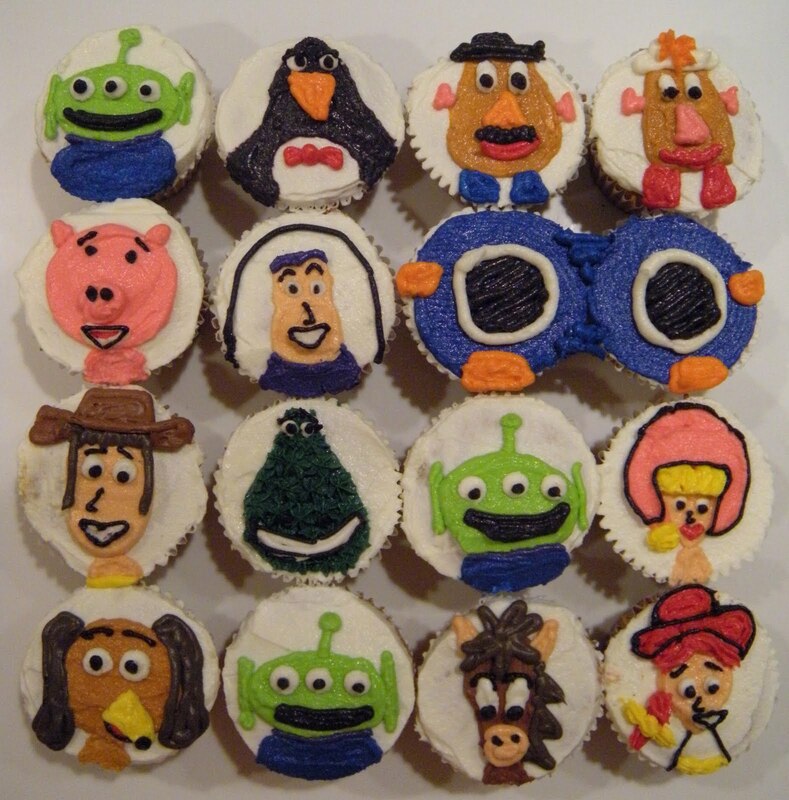 After watching the new show Cupcake Wars, I was inspired to create new and innovative cupcake flavors as a challenge to myself. If you can leave a comment and suggest some unusual/fun ingredients for me to try to incorporate into cupcakes, that'd be great. If I go with your suggestion, and it turns out well, and you live in my area, I'll deliver YOU the cupcakes as a thank you! Some examples would be: fruits that aren't usually used in cake (ex. canteloupe, watermelon, etc), vegetables, cereals, sodas, unique dairy products--anything FRESH would be preferred to frozen items. Please, give real suggestions--nothing disgusting. Of course, ALL cupcakes (good and bad) will be displayed on this blog for you to follow along. I made this cake for my friend John, whom I've gone to school with since elementary school. He's going to Case Western University this fall, where the mascot is the Spartans. I first covered the cake with fondant, then piped the design overtop. I made these cakes (and cupcakes) for my boyfriend Alan's little sister Stacy and her friend Emma. 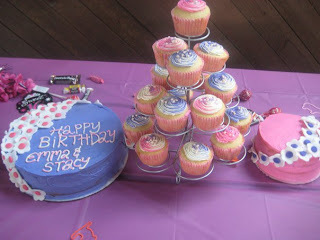 The color scheme was pink and purple, so I swirled pink and purple in with the white icing for a cool effect. I curled shape into the flowers and draped them across the cakes. My friends Dillon, Julie, and I have a running joke about people being 'grumbly'. 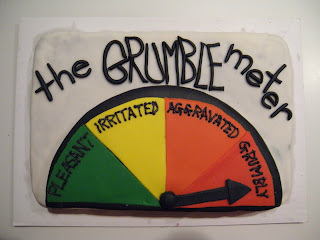 grumbly [gruhm' blee] adj: bitterness, grumpiness, or snappy behavior typically associated with sleep deprivation and/or hunger. Dillon often used this word to describe my best friend Julie, who is very pleasant and sweet, but often would get a tad irritated at lunch time (which coincided with her waking up from her 1st-3rd period nap). Julie isn't the only grumbly person out there though; everyone has his/her grumbly moments, some people just don't get called out about them. Dillon has grumbly moments, our teachers have grumbly moments, strangers have them...I don't have them, of course, because sweet cupcake bakers don't ever get grumbly. 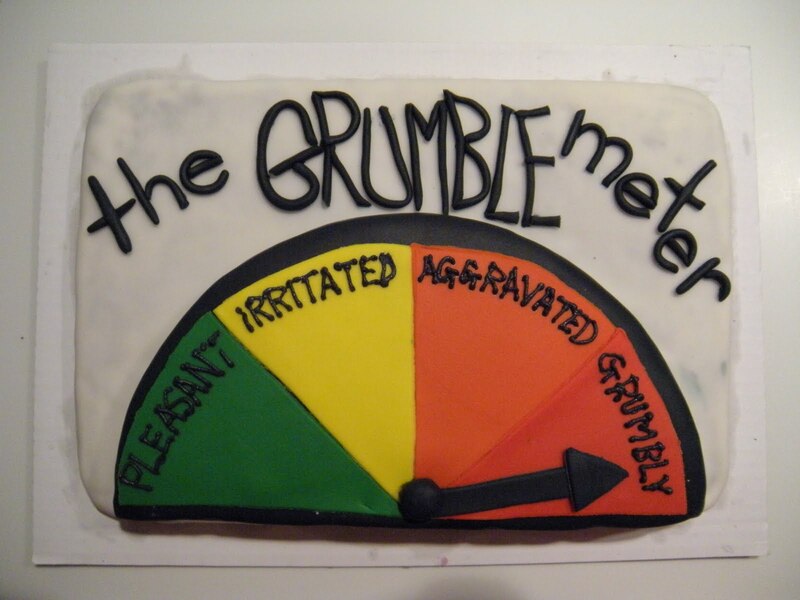 :) Anyways, so I made this cake for Dillon's 18th birthday to follow up on our inside joke--it's a meter to measure a person's grumblyness. Try to stay in the green zone, please. Actually, there's only 140 of them. 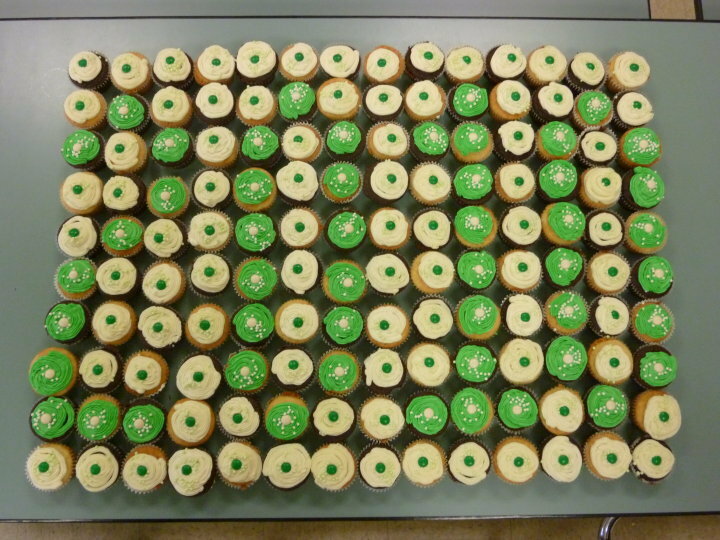 I made these cupcakes for my Senior Class Night at school this past week. I officially graduate tonight, but the class night is a tradition for the day before the last day of school. I carefully planned out this design so that the flavors alternate--in theory a good idea, but actually it makes it semi-impossible to look at them closely. 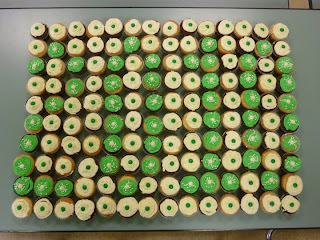 We let the cupcakes sit untouched for about 10 minutes before allowing the class to devour them. Each cupcake is topped with a colored M'n'M (you can buy them in single colors at craft stores) and sugar pearls in that same color. GO SEN10RS! I am 22 years old and cake-baking is a hobby of mine. If you are in the Maryland, D.C., or Virginia area and would like a custom made cake, contact me at melia@mmmeliacakes.com. I started baking cakes when I was 12 years old. 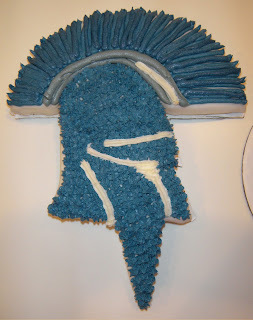 At first, I would just play around with different shaped Wilton pans and experiment with making my own flavors. I've never had professional lessons, I just kind of taught myself things--I don't do things the typical way, but I'm proud of the methods I've invented. Every cake is a new learning experience for me.